Doors rubbing against the door frame can sometimes cause the door to stick. Changes in humidity through the seasons can result in doors sticking sometimes and not at all at other times. Doors can also stick due to structure shift and out of square door frames. 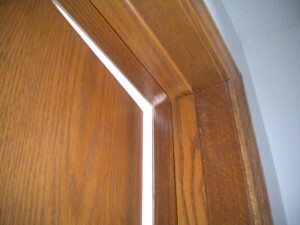 Most door rubbing and sticking problems are a result of two common problems I typically find during a home inspection. First, hinge screws are loose. Tightening the screws will pull the door back into place, allowing for proper operation. Secondly, doors can also swell due to humidity, closing hard in the summer and working perfect in the winter. Check the hinges to make sure they are tight and supporting the door properly. If the hinges are loose most likely the hinges are the reason why the door is rubbing and sticking. If this is the case, tighten the screws. If the screws won’t tighten, try an old time carpenter’s trick to tighten loose screws. First, support the door and take off the loose hinge screws. Next insert toothpicks into the screw hole or holes with a dab of glue. Allow 20 minutes for the glue to dry and then reinsert the screws. You’ll be amazed at how tight the toothpicks have made the screws. I've used this trick countless times over the years...It works. If the hinges are tight but the door is rubbing, the door needs to be trimmed. An inexpensive tool can be bought to do the job. The tool is called a block planer hand rasp. The cost is probably under $10 and can be purchased at your local hardware store. It looks like a small hand held flat cheese grater. This quick repair is done with the door in place. There is no need to remove the door. Mark the door with a pencil where the door is rubbing the frame. Now that the spot is marked, you can proceed to plane the area on the side of the door that is sticking until the door closes properly. This type of repair usually only takes a few minutes and very little material has to be removed from the area that sticks. If you have to remove a lot of material to make the door close, it would probably be better to have a professional carpenter evaluate the door problem.